That Bloomin' Garden | NetClimber Web Design Inc.
Kristin Crouch (of That Bloomin’ Garden) came to us with an unforeseen problem – she had run out of space on her blog at WordPress.com. 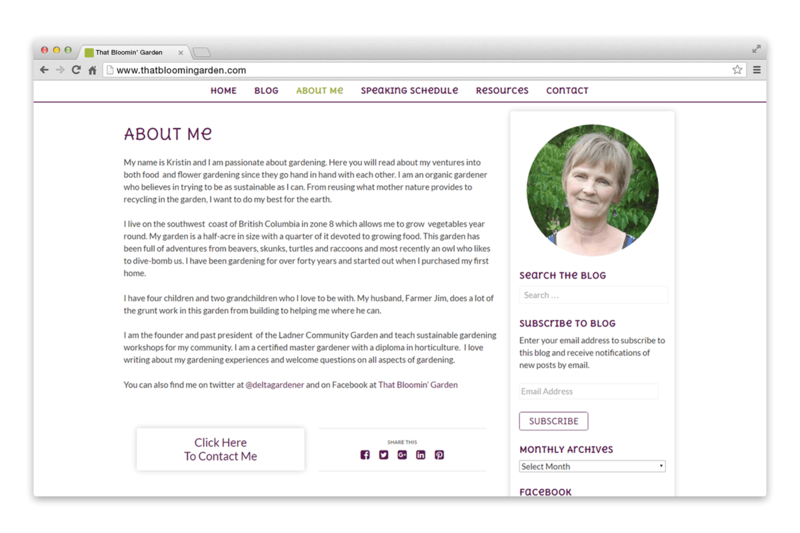 Kristin is an avid writer and gardener and has developed quite a following of her blog and speaking engagements. 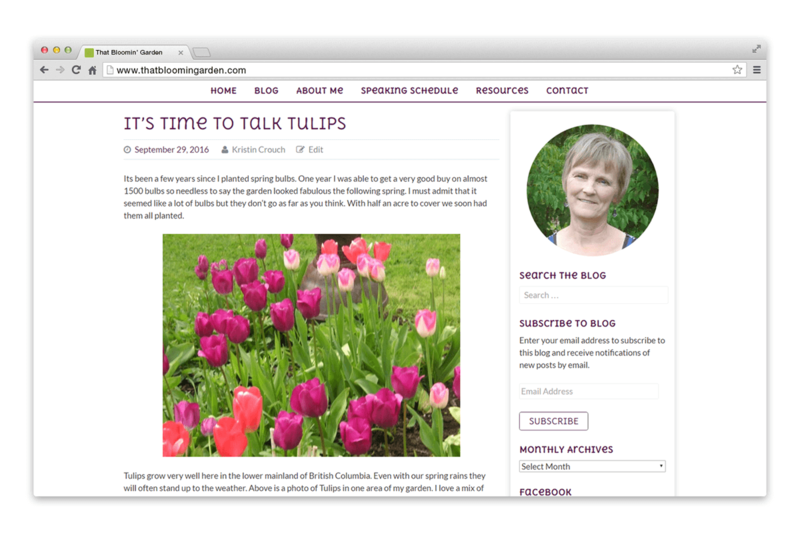 Her blog on the WordPress.com platform had been growing for several years and had loads of great photos and advice on everything from when to prune; to how to plant; to recipes using what you grow. Kristin needed a website to promote herself as well as her blog and she needed a lot more space to keep up with her love for generating rich content. There were several stages to the “That Bloomin’ Garden” project. First, the WordPress.com blog had to be moved to her own domain. WordPress.com is useful for those not needing their own private domain but Kristin wanted to brand herself and getting her own domain name was first step toward that end. The blog transfer was a multi-staged process that took a little while due to the size of the database. At last, the site was up and running with Kristin’s years of content in place on her own domain ‘thatbloomingarden.com’. Now, NetClimber wanted to make it look like her. The next step was some branding. Kristin’s unique personality and passions needed to be captured and conveyed throughout the website. To do this, we developed a logo for her that looked like some of the artwork she does. For the typography on the logo our graphic designer wanted something to convey Kristin’s traditional “down-to-earth” values, her lighthearted outlook and still incorporate a hand-made, trendy feel. Interestingly enough, one of the fonts chosen is even called “Kristen” – how perfect a fit can you get! The clean logo and bright colors were important to carry through on the web design. We didn’t want the branding to detract from the content – just support it. We used webfonts in line with the brand and used a lot of white space to keep the feeling light, clean and professional. For the website functionality – it was key that the Blog was all important. To do this we added extra space on the Home Page to show off lots of Recent Posts. 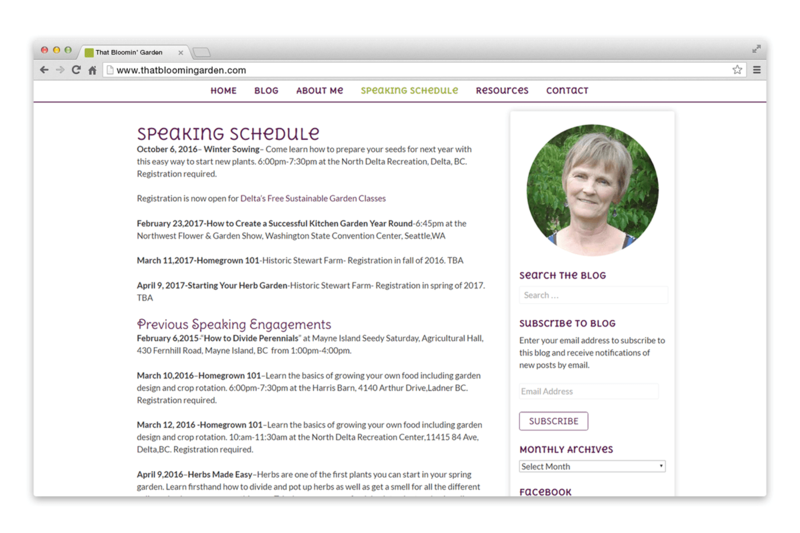 Focus was next given to Kristin – showing her Bio page and Speaking Schedule in hopes of expanding her marketing reach. A newsletter sign-up form was important too, so she could send email blasts about upcoming speaking engagements or special posts. Social feeds are highlighted since Kristin is so busy on Facebook and Instagram. Her variety of photos look great on the site, adding lots of interest and colour. Clients like Kristin are a website developer’s dream because they have already done the difficult groundbreaking work in gathering a following and getting people interested in visiting the website. 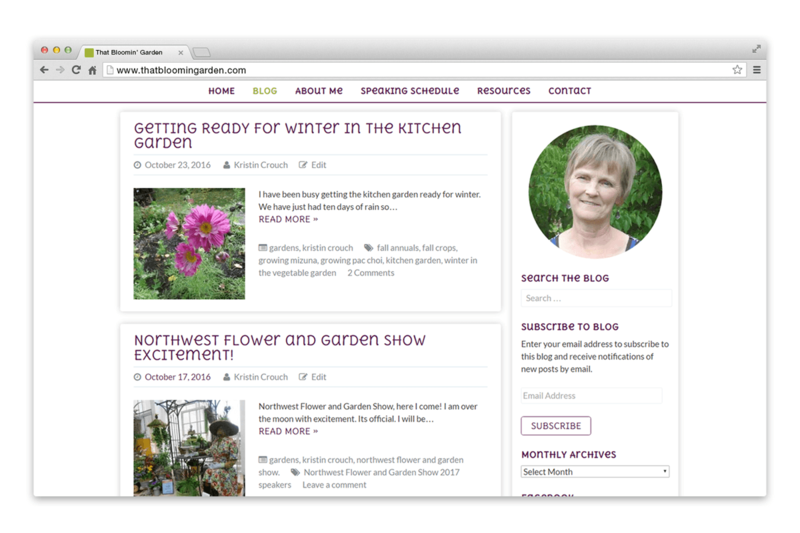 While “That Bloomin’ Garden” project had many offshoots to it, NetClimber was excited to bring this thriving blog to the forefront. 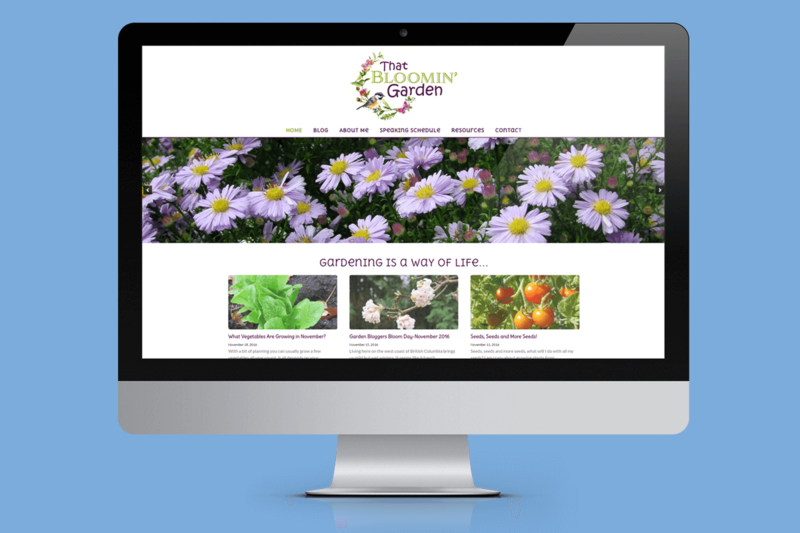 The new website supports the rich content with a fresh and inviting look – hopefully something that many gardeners continue to enjoy reading.